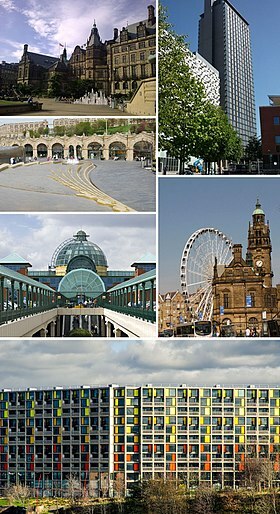 Clockwise from top left: The Sheffield Town Hall; St Paul's Tower from Arundel Gate; the Wheel of Sheffield; Meadowhall shopping centre; Sheffield station and Sheaf Square. Park Hill at the bottom. نعرہ: "Deo Adjuvante Labor Proficit" "With God's help our labour is successful"